Cycling from the Farmhouse is a joy, routes can be gentle and a good introduction to the pastime or as challenging as any experienced rider could want. As someone who only began riding when I arrived in France full time, a year ago, my circuits are around 50 kilometres in length and take me two and a half hours to complete. France is three times bigger than the UK and has the same population, as a consequence the roads are much quieter, ideal for safe and enjoyable cycling. In this guide I’ll share two of my favourite trips from The French Farmhouse, together with an introduction to cycling along the Lot River for beginners. Riding between the valleys around The Farmhouse is a heart thumping and exhilarating affair. 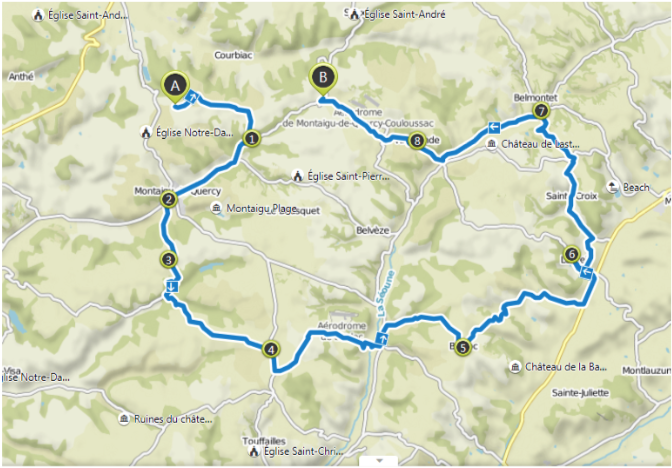 This route has three long climbs, the first between points 2 and 4 as you climb out of the valley in which Montaigu de Quercy sits, the second is short and sharp from the valley of the river La Seoune up to Bouloc ( point 5) this is the highest point on the journey. The third climb is when you leave point 6 on the way to Belmontet. As a reward you experience three thrilling downhills, I dare you not brake as you make your way around the hairpin bends between points 5 and 6 or when you top 50 km per hour on other long stretches. Apart from a small section between points 1 and 2 and before point 6 the rest of the route is on country lanes which are for the most part in good condition with no pot holes to ride through. Cycling is a great way to get to know the area, it’s very rural so you will get an understanding for the crops grown and the animals kept. There is a burgeoning ‘bio’ or organic trend developing in agriculture and just about everything produced can be bought in ‘bio’ form. To the Lot and back. Once you’ve descended from A to B you are in the Courbiac valley, this is a long gently ascending trail which is the home for a number of water mills and magnificent Chateaux. This route takes you through Belmontet and onwards to Lasbouygues. By this time you will have gained significant height and just after point 3 you cross the main road from Cahors to Tounon d’Agenais. Between points 3 and 5 you are cycling through hectares of vineyards mostly producing the Malbec wines of the Cahors region. Once you get to Belaye I recommend you stop by the viewpoint to look down upon the meandering Lot and the farms nestled within the bends of this splendid river. You touch the Lot just after Grezels and then turn homeward and a long climb up to the Bastille town of Floresssas. Across the plateau once more and you pass through Masquieres before crossing the main road once again and dropping back down to the valley to where you began. Having ascended the final hill home you will have travels 57 Km and climbed over 700 meters. Well done. A cycle along the Lot River from Fumel to Puy-l’Eveque is a great ride for beginners, cycles can be hired at a number of places along the route if you need one. The route out of Fumel follows a disused railway line and like the rest of the route is flat and easy to navigate. As this is a holiday area you will pass a number of campsites some of which allow day entry to their facilities which includes river side beaches. Once you’ve passed these you are out into open country and you hug the river as it meanders south and then north to through the small villages of Touzac and Duravel. Once again most of the land is turned over to growing grapes and at the bottom of the valley the land is flat. Cycling at a leisurely pace the ride to Pay-l’Eveque should take about one and a half hours. The town is a great place to stop for lunch, either a picnic by the river or in one of its café / restaurants. More details of all these rides can be found in our information pack at The Farmhouse. Why not stay at The French Farmhouse and enjoy cycling in South West France. Click on the Home button to see the facilities we offer at FFQ.